Made in West Germany to exact original equipment specifications of nickelplated hardened steel. Replacement metal bobbins for the following Bernina freearm machines this is a partial listing, this bobbin may fit other machine as well: 125, 1305, 1405, 150, 1605, 43040, 700071930, 80001073040, 9001030, 1020308090, 112030, 1230, 1530. 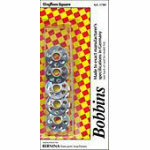 5 bobbins per card. 6 cards per box. Purchase by the box.